Modern Cities takes a look at the sunny side of the ditch, in a community entrenched in history, with a recent flair for modern homes and neighborhood compactness. Owing much of its existence to railroad magnate Henry Flagler, Atlantic Beach is Duval County's densest municipality and home to one of the region's most popular pedestrian friendly retail and dining districts. Join us as we stroll down this part of the Jacksonville beaches, known by the locals as 'AB', where 'everyone knows everyone' is no exaggeration. Henry Flagler opened the Continental Hotel on June 1, 1901. This massive wooden yellow hotel was 47 feet by 447 feet with a six story rotunda and five story wings. The hotel contained other buildings such as servants’ quarters, a bowling alley, a power plant, water works, pier and a railroad depot. The Continental would burn to the ground in 1919. Atlantic Beach was a small seaside community around 1900 when Henry Flagler, builder of the Florida East Coast Railway, built the Mayport branch of the railway and erected a station just north of the former Atlantic Beach City Hall (Now Adele Grage Cultural Center). 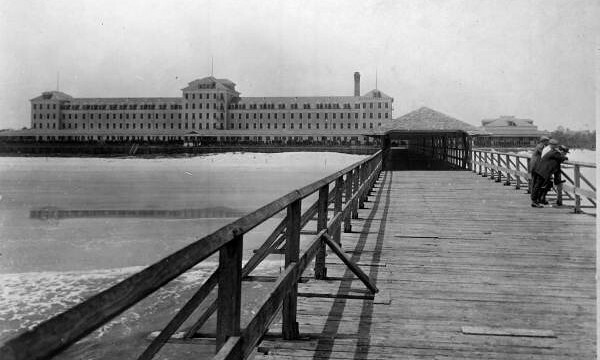 The Continental Hotel, with approximately 300 rooms, was built soon thereafter on a tract of land lying between the depot and the beach. The land surrounding the hotel was subdivided and sold for summer homes. Promotional activities to attract tourists included auto races on the beach and air shows and the area experienced considerable growth. In 1913, the railroad sold most of the land to the Atlantic Beach Corporation, headed by Ernest R. Beckett, which began paving streets, installing lights and water and sewer lines. However, during World War I, people were afraid to come to the coast and the Atlantic Beach Corporation went into bankruptcy. After the war, land began to sell again and the settlement began to grow. The Town of Atlantic Beach was incorporated in 1926 and the Governor appointed Harcourt Bull, Sr., as the first Mayor. A tract of land was purchased from the railroad and was developed as the Town Park and became the site of the first Town Hall. The building burned down in 1931 and a new Town Hall was built in 1932 at 716 Ocean Boulevard. The first Charter was adopted in 1929, and in addition to the Charter officials, the town had one additional employee. The town continued to grow and by 1940 there were 38 employees and a taxable value, after the homestead exemptions of $1 million dollars. A new Charter was adopted in 1957 making Atlantic Beach a city. With the opening of the Mayport Naval Station in the 1940’s and the construction of the Matthews Bridge in the mid 1950’s, the area became ready for development. Atlantic Beach was getting its water from a private water plant under lease, which was inadequate for both domestic and fire use. With an annual budget of approximately $100,000, funds were not available for major capital improvements. The citizens of Atlantic Beach approved the issuance of water revenue bonds and a two million gallon per day water plant was constructed. In 1957 and 1958 the Atlantic Beach water system received the Florida State Board of Health Merit Award for the best operated primary water treatment plant for cities under 10,000 population in the state. During that time, the city embarked on “Operation Bootstrap,” and within the next few years, with additional funds from a general obligation bond, the city constructed a sewer plant with the necessary lift stations and outfall lines, built a fire station, purchased 750 gallon per minute custom pumper and added three paid firemen to staff the station twenty-four hours a day. An air conditioned jail and police station with a radio system was constructed, the city purchased two new compaction garbage trucks and provided daily garbage collection, acquired a new city yard and constructed a storeroom and garage, paved streets and installed street lights. The city boundaries were extended in 1987 by annexation of the Seminole Beach area to the north and again in 1996 by extending the westerly boundary to the Intracoastal Waterway. The city is approximately three square miles in area and has almost two miles of ocean beach. The old fire station has been replaced by a public safety building located at 850 Seminole Road. The city maintains its own Police Department, and fire and emergency services are now provided by the City of Jacksonville from the 850 Seminole Road location. In 1991, the city administrative offices moved to a new city hall located at 800 Seminole Road. Soon after this, the old city hall was turned into a community center and named the Adele Grage Community Center in honor of longtime City Clerk, Adele Grage, and came under the jurisdiction of the Parks and Recreation Department. Various community groups and organizations used the building for meetings and social activities. In 1993, the City Commission authorized the Atlantic Beach Experimental Theater (ABET) to use the former commission chambers and adjoining offices for a community theater. In 2002 a major renovation was completed and community rooms, a resource center, gallery, verandas and new restrooms were added. The building was renamed the Adele Grage Cultural Center and fulfilled the need for a facility capable of meeting the cultural and community needs of a growing and culturally enlightened population. Fundraisers were held and public and private donations paid for much of the renovation. In 2001, members of Beaches Habitat for Humanity constructed Jordan Park Community Center located at 1671 Francis Avenue with city-supplied building materials in exchange for permanent office space in the building. Much of the development in the city has been residential, with single-family homes accounting for most of the developed land areas. The city is nearing build-out with less than 10% of the incorporated land area being undeveloped. The city has a commission-manager form of government with an appointed manager who reports to the four commissioners and a mayor/commissioner. William S. Howell served twenty-seven years as mayor and holds the longest tenure, a record, which may remain unbroken since, in 1991, the city commission established term limits for elected officials. Recent city commissions have recognized the need to acquire land to be developed for recreational purposes while a few large tracts of land were still available. In 1994, the city acquired approximately eight acres on the Intracoastal Waterway and with the use of grant funds, developed Tideviews Preserve as a passive park with trails, a boardwalk for viewing wildlife, canoe launch and picnic areas. In 1998, the City of Atlantic Beach, in a joint venture with the City of Jacksonville, acquired a twenty-seven acre island now known as Dutton Island Preserve. 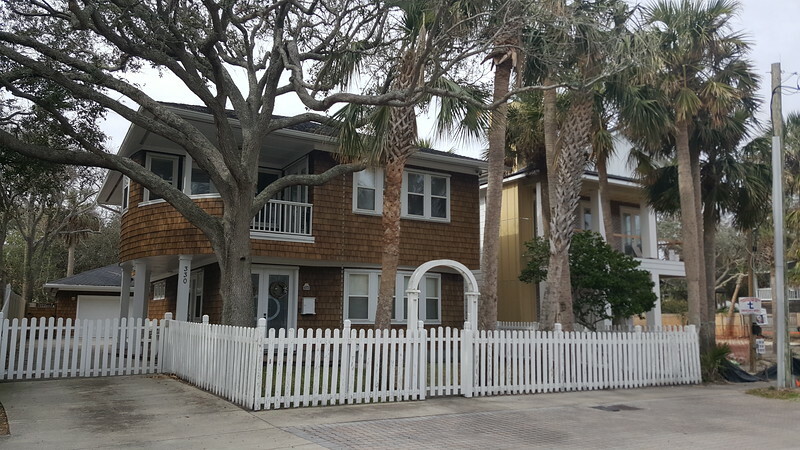 The City of Atlantic Beach’s portion of the purchase price was paid from Florida Barge Canal funds and no Atlantic Beach tax money was used for the purchase. The island is experiencing on-going development as a nature park to include trails, a floating dock for launching kayaks and canoes, a fishing pier, camping sites and pavilions. 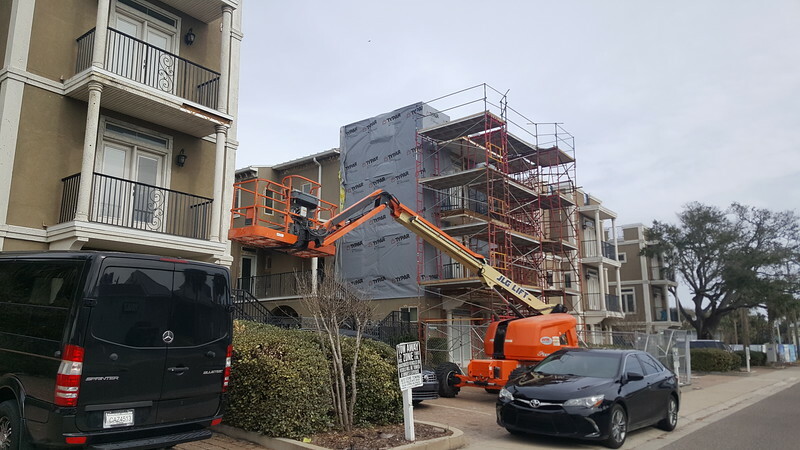 Residents may now enjoy more than sixty-five acres of parkland. 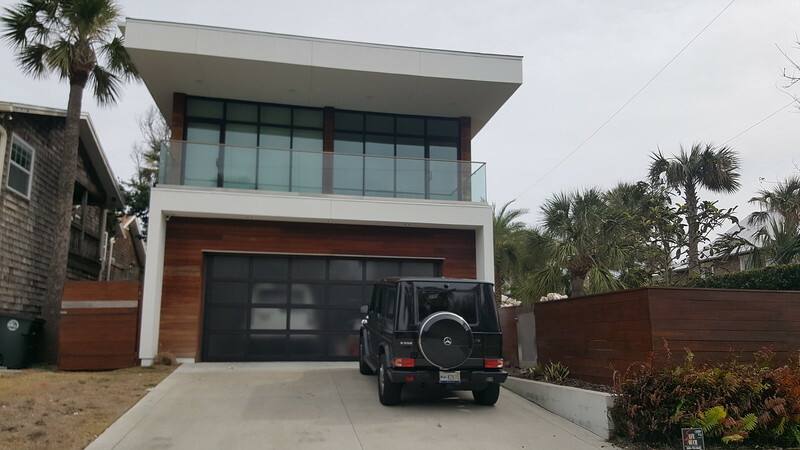 Today, Atlantic Beach is a mostly residential community whose approximately 14,000 citizens enjoy an enviable quality of life.